Ten Zambian women sit in a row, readjusting hairdos and smoothing skirts in a flutter of nerves. Another young woman is in tears on the manicured lawn of Lusaka’s Chinese embassy, with a number 1 pinned to her prom-style dress. This isn’t a beauty pageant. It’s a Mandarin proficiency contest hosted by Hanban, the state-run Chinese organization that is driving the largest language and culture-promoting initiative the world has ever seen. The first round is delivering a speech in Mandarin. The tearful woman, a student at Hanban’s Confucius Institutes (CI) at the University of Zambia, is first. She mumbles through a collection of syllables, repeating part of her speech before reaching an unceremonious ending. A stern-looking Chinese judge asks if the contestant could say something about the dreams to which she alluded in her speech. As the audience waits in silence, the judge repeats his question. “What are your dreams?” The contestant scans the room for inspiration. The first prize is a scholarship to China, and she isn’t admitting defeat just yet. “My dreams…?” she parrots in Mandarin, and hesitates again. “Wode mengxiang shi Zhongguo” or “My dream is China,” she says. China is driving the largest language and culture-promoting initiative the world has ever seen. Hanban is a vital ingredient in China’s global soft power campaign. Since the first CI was set up in Seoul 13 years ago, 516 of these language and culture centers have opened in 142 countries and regions, over 40 of them in Africa. While Beijing’s language and culture drive has provoked suspicion and controversy in the US, it is steadily winning hearts and minds on the continent, where brand new CI buildings often stand in contrast to crumbling campuses. If there’s one part of the world where CIs have the potential to shape public opinion, it’s Africa, says Falk Hartig, a postdoctoral researcher with a special interest in CIs and China’s public diplomacy. The CIs, hosted in universities, and the Confucius Classrooms that are hosted in primary and secondary schools, are cementing the foundations for Africa’s future relationship with China. In Harare, a well-polished bust of Confucius welcomes guests in the lobby of the University of Zimbabwe’s (UZ) Confucius Institute. A photograph hangs above it, in which the university’s vice chancellor is being presented with the award for “CI of the year” for the second time at a ceremony in Beijing. The photograph is one of about thirty in the lobby and its adjacent classrooms, each showing smiling interactions between Chinese and Africans. China’s economic success is its most potent public diplomacy tool in Africa so Mandarin is seen as a fast track to success. UZ is the alma mater of the first Zimbabwean to obtain a PhD in Teaching Chinese as a Second Language. Professor Herbert Mushangwe’s last-minute decision to accept a Chinese scholarship ended up changing the course of his career. After seven years in China, he co-authored the world’s first Shona-Chinese dictionary. China’s economic success is its most potent public diplomacy tool in Africa where ambitious Africans increasingly view Mandarin as a fast track to their own success. Several UZ students and staff members have followed in Mushangwe’s footsteps. The university now counts seven Zimbabweans among its team of approximately 18 Mandarin teachers. The Chinese-built Confucius Institute at University of Zambia, Lusaka. Although the “Look East” Policy was originally a Zimbabwean government response to Western-imposed sanctions, it has become a broader African trend to emulate the political and economic model which has lifted over 800 million Chinese out of poverty since the Deng Xiaoping era. China’s growing scholarship program is motivation enough for students like Nancy, whose family struggles to cover her tuition. Recent data shows a remarkable spike in the number of African students studying in China, from just 2,000 in 2003, to almost 50,000 in 2015, whether on scholarships or their own steam. 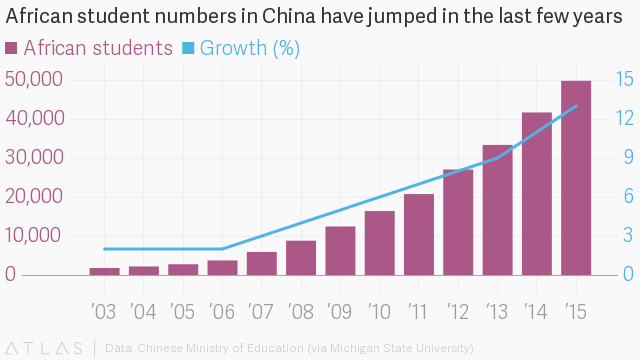 This makes China the most popular destination for Anglophone African students studying abroad. This dramatic increase follows the 2015 Forum on China-Africa Cooperation (FOCAC), where China promised to provide 30,000 scholarships to African students by 2018. Estimates based on FOCAC data suggest that China is on track to reach this target. If Nancy is granted the scholarship that she so badly wants, her whole family will feel the impact of China’s diplomatic gesture. “In underdeveloped parts of the world, Africa especially, China, or Hanban, has been instrumental in promoting the interests and the initiatives of cultural diplomacy through the CIs,” says Martyn Davies, who worked closely with the Chinese government in setting up Africa’s first CI in South Africa in 2004. At the University of Zambia’s CI, almost none of the students in the Chinese Degree Program are ready to attempt the intermediate level Chinese Proficiency Test (known as HSK 3) that is required for entering a Chinese university. One of the students who competed and lost at the Mandarin proficiency test held at the Chinese embassy arrived at her intermediate Mandarin class the next afternoon to find the Chinese word for “nervous” on the vocabulary list. As badly as Beijing wants the world to believe that the influence of Mandarin is growing across the globe, teaching quality is secondary to the impression that China’s ever-expanding Confucius Institute network seeks to project, and students who are linguistically ill-equipped are sent to China for scholarships and study programs, regardless of what they might gain. Students at Mlimani Primary School’s Youth Chinese Test certificate awarding in Dar Es Salaam, Tanzania. In Tanzania, students at the Mlimani Primary School in Dar Es Salaam are called to the front of the classroom to receive beginner’s Mandarin certificates for the Hanban Chinese test for youth. A young Chinese teacher in heels takes photographs with an SLR camera. The shyer students have to be swiveled around to face the camera. The photographs will be sent to Hanban, and then perhaps to Xinhua, or CGTN, or another of the state media houses that broadcasts across the African continent. In Tanzania, where the national broadband network was designed and installed by Chinese tech giant Huawei, ICT student Elias Elisante is taking extra-curricular classes at the CI at the University of Dar Es Salaam so he can access Chinese resources online. At a CI in Zambia, free Kung Fu classes have given rise to a troupe of martial artists, who practice every weekday in satin uniforms until their movements cast long shadows at dusk. For many, learning martial arts is a stepping stone to learning Chinese and, from there, a scholarship to China isn’t far away. “The experience that students get in China can translate into a willingness to work with China and view China’s internal or external policies favorably in the future,” write researchers Victoria Breeze and Nathan Moore regarding the dramatic increase of African students in China. Has Hanban made China’s language and culture hotter than Hollywood? Not quite. But, China does offer developing Africa both real and imagined tools that may be pivotal to the continent’s rise. According to a recent Afrobarometer poll, 63% of respondents from 36 African countries said that China’s influence at home was positive, primarily due to investments in infrastructure and business development. Zimbabwe, Zambia and Tanzania were among the countries where China’s influence was perceived to be most positive. In Dar Es Salaam, while Tanzania’s future Mandarin speakers stay after school for Chinese class, other children pass by on their way home. They see a foreign face gleaming in the sunshine, and many of them stare. Some giggle, some wave, but one child calls out “Ni hao”—Hello, in Mandarin. With the ubiquitous presence of Chinese investment, Chinese businesses, and Chinese immigrants in Africa, it may not be long before “Ni hao” becomes the new “Hello,” used by Africans across generations. This article was made possible by a grant from the Wits-Africa China Reporting Project at the University of Witwatersrand.